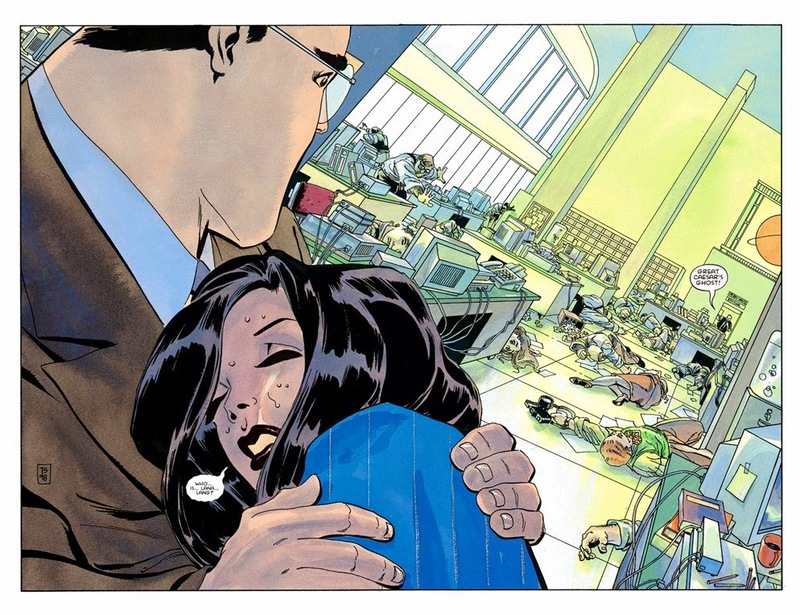 Jeph Loeb and Tim Sale have done a lot of work together. I’ve had the pleasure of reading a lot of their collaborations (though not all) and I’ve enjoyed them to varying degrees. The more recent book of theirs that I’ve read is Superman for All Seasons and I really like it. I was expecting something similar to what he did at Marvel with their origins stories for Daredevil and Hulk. That’s not exactly it. It’s also different form their work on Batman which focuses, more or less, on telling mysteries set Gotham that used many of the main cast of characters from Batman stories. Superman for All Seasons begins with Clark Kent’s late adolescence and tells the story of his first few years as Superman. It’s not an origin story, not really. Nobody even mentions Krypton. It’s more of a story about Superman than a Superman story. I’ll do my best to explain that but let’s backtrack a little. I’m not a huge fan of origin stories but hey are necessary to have for characters that live in a serialized medium like comic books. Knowing a character’s backstory, their very beginnings, helps to define a character. It gives them motivation and it helps the reader better understand why a character does what they do. The problem I have with origin stories is that some people feel it’s important to retell them over and over again. Reimagined origins or retelling with the purpose of focusing on a specific aspect of the character that was at best loosely defined before or at worst tacked on to the character later on in order to modernize them or make them more accessible to a new generation of readers. Personally I think it’s annoying as hell to have new original stories for some of the most popular superhero characters every few years. Batman and Superman have probably had more versions told of their origin stories than any other superhero characters. I haven’t read Superman for All Seasons until now because I thought it was going to be another original story. I gave in because I felt like reading a Superman story and I hadn’t read this one yet but mostly I picked it up because of Tim Sale’s art which I really like. I like the way he draws Clark Kent and Superman. He convincingly makes them look like different individuals without giving them different body shapes or giving one different physical attributes than the other. His Clark Kent is wide and solid looking. He’s big but Sale gives him delicate features which makes him boyishly handsome while also giving him an air of friendliness and approachability. He convincingly illustrates the alter egos of Clark and Superman. Clark wears clothing that is a little loose which retains his bulky look without giving him muscular definition. His glasses accentuate his innocence and friendliness. When he’s Superman, his costume is tight, which serves well to show off his muscles which immediately gives him a strong presence. Without his glasses his eyes are drawn to be very squinty but it’s done in a way as to make him more threatening. This doesn’t always work because his features are still drawn rather small for the size of his body, particularly his face, but in doing so Sale maintains an air of approachability while also giving him a bit more menace (he’s a crime fighter after all). Sale didn’t disappoint with his work on this book. It helps that Bjarne Hansen did a wonderful job with the colouring. The entire book is given a classy painterly look. The colour palette is nuanced and soft but it does so without becoming lifeless, stiff or muddy. Sale’s art is usually very clear, even when he uses a lot of black shapes. With Superman, compared to his Batman work, there are very few pages with heavy inks. Instead there are clear lines, well defined shapes but it’s Hansen that gives the art its depth. He grounds the characters into the background and he helps to sell the double-page spreads throughout the book of which there are many. 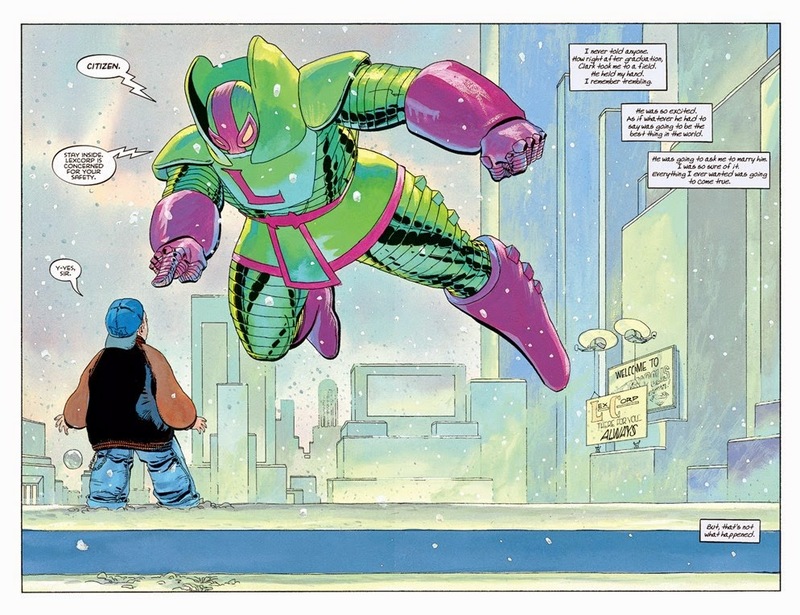 One of the tricks Hansen did in the comic that I like was using slightly flatter colours for the superheroic elements of the story, like Superman’s costume or Lex Luthor’s robots. The bright colours contrast with the painted colours used throughout the book and the effect is to make all the superhero stuff leap off the page. It’s quite a pleasant and effective colouring technique. While the art was good, even better than I was expecting, partly because of Hansen’s colouring, the story is what made this comic so damn good. I previously said that this comic isn’t a Superman story, it’s a story specifically about him and that’s the great idea that gives the comic its thematic weight and separates it from so many other Superman comics. People say that Superman is different from other super heroes because his “real” identity is that of his super-powered identity, not his human identity. I think that depends on who is writing Superman. Some people say there are two types of Superman stories: those that focus on the man and those that focus on the super. I would say that this particular story focuses on the man. In writing Superman for All Seasons Loeb focuses on the man, specifically he focuses on the idea that Clark Kent becomes the hero of Metropolis because of the nurturing and care given to him by Jonathan and Martha Kent who found him in a rocket ship when he was still a baby. With this comic, Loeb argues that its nurture, not nature, that helped shaped Clark into a heroic figure. By doing so, he’s also clearly establishing his Superman story as one of those that focuses specifically with the man. As you might have guessed from the title, Superman for All Seasons is divided into four chapters, each one dealing with a particular season. 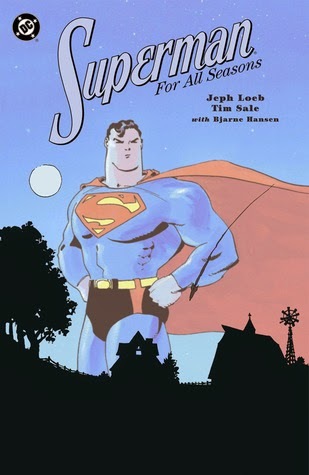 Each chapter is also narrated by an individual close to either Clark or Superman. The narrators and chapter pairings are: Spring/Jonathan Kent, Fall/Lois Lane, Summer/Lex Luthor and Winter/Lana Lang. 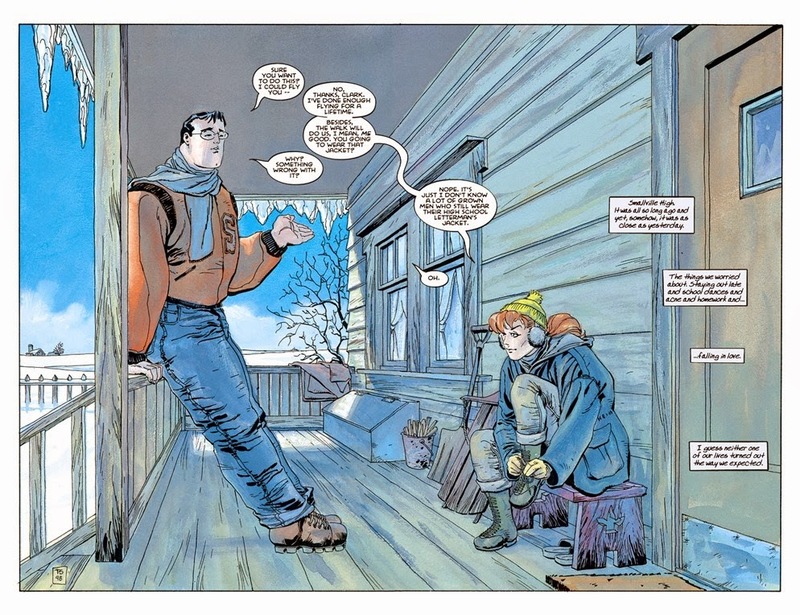 The Spring and Winter chapters focus on Clark and how the emergence of his superpowers have affected him and the people from Smallville that are closest to him. The Summer and Fall chapters focus on the Superman identity and how it has affected the city of Metropolis and some of its key individuals. I think that the Spring and Winter chapters are the highlights of this book as Loeb succeeds to make Clark’s fantastic emotional turmoil relatable and believable. Sometimes, when the corn was planted, it shot up to soon. / The roots hadn’t taken hold, so the stalk couldn’t support its own weight. / The corn would turn sour. 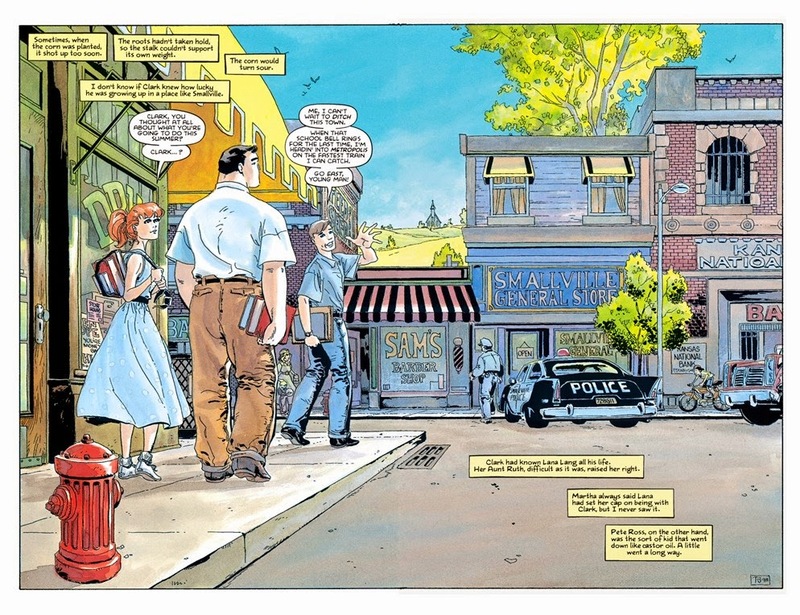 / I don’t know if Clark knew how lucky he was growing up in a place like Smallville. The narrator is comparing a stalk of corn to Clark. Being raised in a small town like Smallville has given Clark the time to set down roots and to become morally grounded. Doing so will make him stronger later in life after he’s “shot up”. The analogy here is likely making reference to moral roots, being raised in a small town has given Clark a specific perspective on life. It’s immaterial and doesn’t focus on financial wealth. Instead, it focuses on family, being kind to others, and finding happiness in small comforts. There is also a link with Clark’s emotional maturity and the development of his powers. It’s telling that his superpowers emerge at the end of his teenage years. By that time in his life he’s already learned the lessons that will guide him in using his power in a responsible way. Certainly there is a learning curve but for the most part the foundation was strong and so he eventually learns how far he will go in using his powers. Another clue as to what this narration can means can be found in Sale’s dedication in the trade paperback. “For Norman Rockwell and his love of a vision of Americana that resonates through its limitations” Many of Rockwell famous paintings and illustrations highlight a simple way of life. His work is underpinned by core American values which were often sentimental and idealistic. He offered a vision of America that was simple yet complex, evocative, and thoughtful. The mention of limitations is linked to the story being told in the second half of Superman for All Seasons. After a confrontation with Lex Luthor, Superman learns that despite all of his powers there are certain things he simply can’t do. He’s superhuman but he’s not omnipotent. This is an important element of his character because the knowledge that he cannot do everything and anything means he, like all of humanity, is required to make choices. He’s had to learn to live with larger than life powers and then he had to learn that his choices as a super-powered being will have larger than life consequences. While it’s not stated in the text as a part of this story, I also like to think of limitations as being an integral part of Superman. As a being that is so incredibly powerful he’s constantly a danger to normal people around him. Losing his temper could accidentally result in large scale destruction and potentially thousands of deaths. How does he interact with the rest of humanity when he’s Clark Kent? In order to function normally he has to suppress his impressive gifts. Many of Superman’s limitations are self-imposed. Limitations in the use of his power, both in what he is willing to do with them and in how much strength he uses in everyday situations. He does this in order to prevent himself from abusing his powers and hurting others. This brings us back to his Clark Kent identity and the idea that Superman is his “true” identity. I completely disagree with this idea of a “true” identity. Superman is a complex character and you could argue that Clark Kent has existed far longer than Superman. Superman is a construct of Clark’s that allows him to use his powers while maintaining a life in which he can, as Clark, live like a man. This is another form of self-imposed limitation because it shows that Clark is not willing to fully embrace, on a permanent basis, the identity of Superman. He wants to maintain his connection to humanity and the best way to do that is to continue being part of humanity. Clark lives a human life in order to continuously provide his Superman identity with moral and intellectual guidance. Loeb and Sale wanted to write a Superman story that lent itself well to large panels, many double-page spreads. They certainly succeed at that. The large panels and the overall decompressed aspect of the writing and the art really help to give this story resonance. 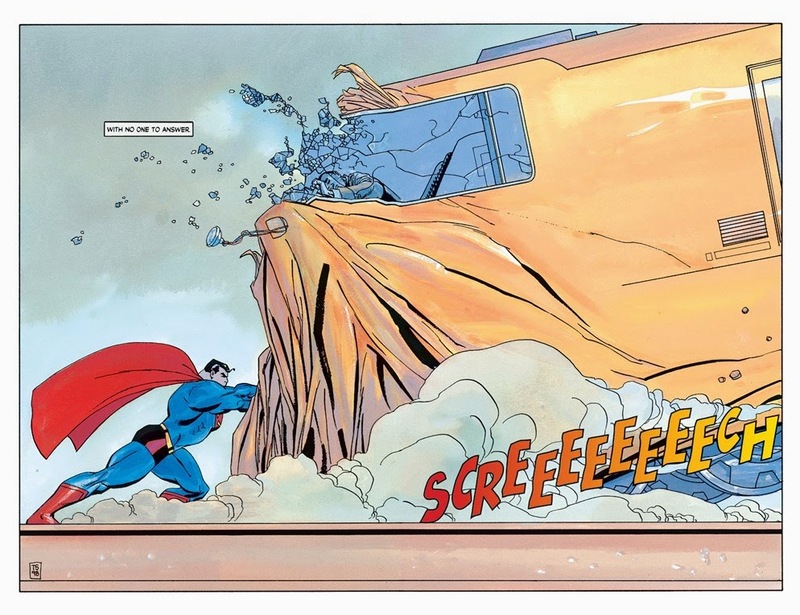 Superman for All Seasons is a contemplative work and by keeping the focus tightly on Clark’s development into his new identity as the hero of Metropolis the creative team succeeds at giving their book the thematic resonance they were attempting to achieve. I particularly liked the use of narrators that gave an outsider’s point of view of Clark’s struggle in cementing his identity as Superman.